Discount all official government statements and major media reports repeating them instead of demanding expert, unbiased views. Officially, Japan's nuclear emergency is under control and contained. In fact, lies substitute for truths, denial for reality, and managed news for honest reporting. Point of fact: Besides its catastrophic quake, tsunami, destructive aftershocks, and resulting humanitarian crisis, Japan is experiencing a developing nuclear catastrophe, the full extent not known until independent sources reveal it. On March 12, a huge explosion rocked Fukushima's Unit 1 reactor. Reports said its containment chamber was intact. Independent experts are skeptical, believing at least some damage occurred, perhaps a major breach now covered up. Japan's Nuclear and Industrial Safety Agency (NISA) blamed a core meltdown for the explosion, releasing hazardous atmospheric radioactive cesium-137 and iodine-131. "This proves once and for all that nuclear power cannot ever be safe. Japan's nuclear plants were built....to withstand natural disasters, yet we still face potential meltdown" disaster. Nuclear expert Helen Caldicott said atmospheric cesium-137 and iodine 131 releases pose grave human health risks. "All of these substances can cause cancer and genetic diseases either in the near or long term." Why are "we mad enough to introduce this disastrous form of energy into our lives," knowing major catastrophes are inevitable, especially in earthquake prone areas like Japan, California, and other vulnerable locations, many throughout the world. Caldicott added in an email to this writer that the situation is "beyond terrifying!!!" Moreover, downplaying the potential severity is outrageous, irresponsible and criminal. Literally, millions of lives potentially are at risk. Further, nothing short of shutting down and dismantling all nuclear facilities is crucial. They're all ticking time bombs waiting to explode, especially ones in seismically active areas. "The Japanese prime minister and the industry safety agency say all plants in the country are safe and that there has been no radiation release from any reactors," when, in fact, NISA confirmed it with few details. On March 13, NEI said there's no danger of a Chernobyl-like event, when, in fact, the threat potential far exceeds it. "Japanese nuclear facilities are designed to withstand powerful seismic events," it said. In fact, substantial damage occurred, its full extent not revealed. Like Japan's prime minister and other government officials, NEI is paid to lie to protect powerful member interests like General Electric. Its Nuclear Energy division is a major producer of "advanced reactor technologies" and related services. "In fact, like any machinery, nuclear plants can - and regularly do - undergo accidents. The big difference with atomic energy: the malfunctions can end up killing large numbers of people and impact other life as well." At worst, however, entire countries, regions or planet earth may be catastrophically harmed. Potentially, Japan's meltdown triggered that type event. Full scale damage control is concealing it, or at least the possibility that it's happening. "Nuclear power plants are, in fact, life-threatening wherever they are - they represent the most dangerous way to boil water ever devised." Readily available "(w)ind, solar and geothermal energy and other forms of safe, clean power would" prevent the deadly fallout from Japan's catastrophe, threatening the entire Pacific rim and beyond, but using them would be bad for business. Companies like GE have plenty of clout to prevent it, placing bottom line priorities above humanity's survival. A second explosion blew off a containment facility's roof. A third reactor's cooling system failed. Officials claimed no reactor's been harmed. As explained above, independent experts are skeptical, believing powerful explosions damage or destroy everything nearby, what official reports won't reveal. As a result, "Japan scrambled to avert (multiple) meltdown(s) at a stricken nuclear reactor on Monday." Live NHK video showed the reactor facility's skeletal remains, thick smoke rising and spreading. Multiple injuries were reported. Workers inside were exposed to extremely high radiation levels endangering their lives. Thousands of quake/tsunami-related deaths are confirmed. Tens of thousands are missing and unaccounted for. In Otsuchi, ICRC's Patrick Fuller described "a scene from hell, absolutely nightmarish." As many as 10,000 people, half the town's population, may have perished, besides many others in Northern Japan. Massive atmospheric radiation is feared, frantic Fukushima engineers trying to contain it. Multiple reactors are affected. Full scale official and media damage control efforts are suppressing bad news. The IAEA said Japan added a third troubled plant, Onagawa, to others under a state of emergency because of failed cooling systems and radiation releases. Later reports suggested Onagawa experienced no leaks, whether or not true. Be skeptical. Flooding two stricken reactors with corrosive seawater (rendering them henceforth inoperable) is "a desperate step to avoid a much bigger problem: a full meltdown," perhaps ongoing but concealed. Japanese officials and media reports call it "partial." Radioactive steam is being released to relieve pressure, spreading atmospheric poison. "Hawaii, Alaska, the US Territories, and the US West Coast are not expected to experience any harmful levels of radioactivity." False! Atmospheric winds and rain potentially may contaminate planet earth, some areas more than others. A worried unnamed official said, "under the best scenarios, this isn't going to end anytime soon," or perhaps well. Another concern affects some Japanese reactors plus others in France and Germany. They use mox (mixed oxide) fuel, containing reclaimed plutonium - the most hazardous known substance. When ingested, a tiny spec can kill. Larger inhaled atmospheric amounts could devastate whole cities. Two damaged Fukushima units use it, Nos. 2 and 3. "Inside the plant....there was deep concern that spent nuclear fuel that was kept in a 'cooling pond' (began) letting off potentially deadly gamma radiation. Then water levels inside the reactor cores began to fall. (An estimated) top four to nine feet of nuclear fuel in the core and control rods appear to have been exposed to the air - a condition that" caused melting, potentially a "full meltdown" that may, in fact, be happening. Using corrosive seawater may, in fact, not work. Because of high containment vessel pressure, forcing it inside is like "trying to pour water into an inflated balloon," according to one unnamed source. It's not clear how much water is getting in and whether cores are covered. Damaged gauges make knowing it impossible, so doing it is seat-of-the-pants, a "Hail Mary" attempt at best. Operating 55 nuclear facilities, Japan relies heavily on them for electricity, at present 30%, a figure expected to reach 50% by 2030 if planned additions are completed. "(M)any Japanese don't trust (what) authorities (tell) them" anymore. Moreover, they "have an uncomfortable relationship with nuclear power" and TEPCO, Fukushima's operator. "As many people (know, it) has a history of not being forthcoming about nuclear safety issues, particularly those surrounding earthquake-related dangers." In 2003, its 17 nuclear plants were temporarily shut for falsifying safety inspection reports. In 2006, it was learned that its coolant-water data at two plants were falsified in the 1980s. Critics have long expressed deep concern about safety at many of Japan's nuclear facilities," some dating from the 1970s and 1980s. "I have been warning about Japan's possibility of a genpatsu shinsai - a nuclear disaster," explaining that many nuclear facilities are hazardously located in seismically unsafe locations. No one listened. On March 13, Kyodo News said another cooling system failed at Tokai's No. 2 facility, 120 km from Tokyo. Emergency measures were taken. Unreliable reports say a backup pump and cooling system are operating. Fukushima's No. 1 and 3 reactors experienced meltdowns. Kyodo called its No. 2 "troubled," raising fears of the worst there, besides what's happening at Tokai No. 2 and perhaps other quake/tsunami affected reactors. "Japan's nuclear crisis verged toward catastrophe" after a third explosion rocked another Fukushima reactor, "damag(ing) the vessel containing the nuclear core (spewing) large amounts of radioactive material into the air, according to the statements of Japanese government and industry officials." Even top officials who lie admitted "a very high risk" exists. In fact, it's well beyond "risk." It's reality, affecting all Japan, the Pacific rim, and beyond. Clearly, a major catastrophe is unfolding. What more is needed to demand an immediate shutdown and replacement of all nuclear facilities worldwide. Their continued use threatens all humanity. Of any magnitude, meltdowns aren't minor, and no structures are earthquake or tsunami-proof. When most intense, Mother Nature prevails. Images of affected Japanese areas and damaged reactor facilities offer proof, besides the potentially massive, widespread human toll. Nuclear plants use radioactive material for heat to generate electricity. Huge amounts are needed. To prevent overheating, "vast amounts of coolant are required, up to a million gallons of water a minute." Without it, meltdowns occur, because "in less than a minute," temperatures can reach 5,000 degrees Fahrenheit - hot enough to "burn through the cement bottom of the nuclear plant" to earth beneath. Nuclear scientists call it the "China syndrome," meaning "it descends to the water table underlying a plant. Then, in a violent reaction, molten core and cold water combine, creating steam explosions and releasing a plume of radioactive poisons." Where it spreads depends on wind velocity, direction, and rain. Nuclear reactors are vulnerable, life-threatening, and "the most dangerous way to boil water ever devised." Deactivating them is essential, especially when safe alternatives exist, so far spurned to pad bottom lines for companies like GE, concerned about profits, not human safety. How much of a threat is the nuclear crisis in Japan? That question is on the minds of millions of people around the globe tonight. Unfortunately, the Japanese government and the mainstream media have both been doing their best to downplay this crisis. Even though there have been massive explosions at the Fukushima Dai-ichi nuclear facility, authorities in Japan have still been very stingy with information and they keep insisting that the situation is under control. But the situation is not under control. In fact, it just seems to get worse with each passing day. Radiation levels are now incredibly high at the Fukushima Dai-ichi complex and the radiation cloud is starting to spread. Radiation levels in Tokyo are already 10 times above normal levels, and there are reports in the international media that some people have begun to flee the city. It is imperative that the Japanese government tell the truth about what is going on because this could potentially affect the health of millions of people. There are over 12 million people in the city of Tokyo alone. If this nuclear crisis continues to get worse it could potentially end up killing more Japanese than the tsunami just did. We are possibly talking about â€œmany Chernobylsâ€�. Unfortunately, it is not likely that the Japanese government or the mainstream media are going to â€œchange their stripesâ€� overnight, so in order to try to get an idea of what is really going on we need to look at the clues. Posted below are 27 signs that the nuclear crisis in Japan is much worse than either the mainstream media or the Japanese government have been telling us. When you take all of these clues and you put them together it really does paint a frightening pictureâ€¦. #2 Andre-Claude Lacoste, the head of Franceâ€™s Nuclear Safety Authority, says that the containment vessel surrounding the No. 2 reactor at Japanâ€™s Fukushima Dai-ichi nuclear complex is â€œno longer sealedâ€œ. #10 A U.S. Navy crew that was assisting in relief efforts was exposed to a monthâ€™s worth of nuclear radiation in just a single hour. #23 Physicist Frank von Hippel recently told the New York Times the following about this disaster: â€œItâ€™s way past Three Mile Island alreadyâ€�. #24 The president of Franceâ€™s nuclear safety authority says that this crisis is now almost as bad as Chernobyl wasâ€¦. #26 One anonymous senior nuclear industry executive told The Times Of India that Japanese power industry managers are â€œbasically in a full-scale panicâ€� and that â€œthey donâ€™t know what to doâ€�. The Nuclear Regulatory Commission is admitting that it is â€œquite possibleâ€� that nuclear fallout from this disaster could reach the United States. In fact, Nuclear Regulatory Commission spokesman David McIntyre says that there could already be radiation from Japan over Americaâ€¦. Right now itâ€™s quite possible that there could be some radiation floating over the United States. But most government officials in the U.S. are insisting that there is â€œno threatâ€� to the health of American citizens from this crisis at this point. Well, if radiation released by a damaged nuclear reactor got up into the jet stream, the first major land mass that it would encounter would be North America. 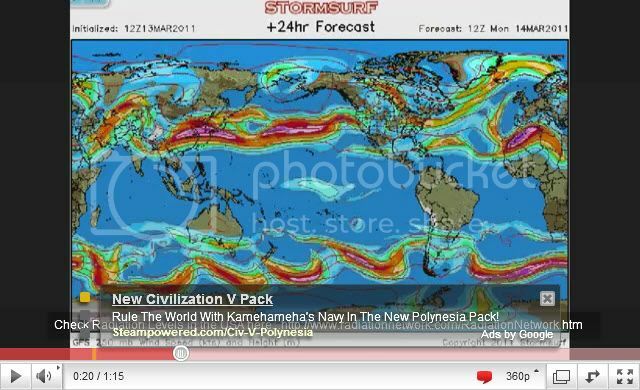 In fact, the jet stream commonly takes air from over Japan directly over the west coast of the United States. The following video demonstrates this fact beautifullyâ€¦.